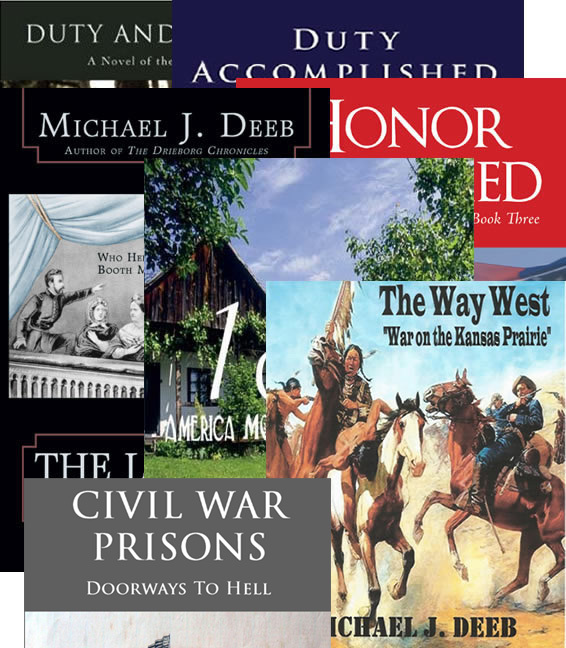 After the fall of Forts Henry and Donelson, everything changed in the Western Theater. 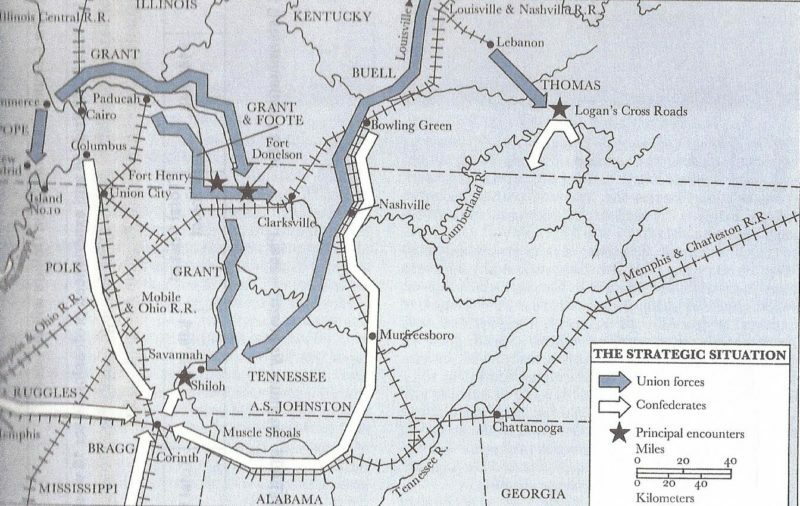 As you follow the white line on the map below, you can see that Confederate General Albert Sidney Johnston felt it necessary to withdraw all his troops from Kentucky. In effect, that state was lost to the Confederacy and the Ohio River would never again be the Northern border of the Confederacy. In addition, General Johnston felt it necessary to continue his withdrawal further South. By doing so, he had to also abandon Nashville, Tennessee. This was not only the capital of that state but was also an major industrial and railroad center. With this withdrawal, the Confederacy also lost Fort Columbus dominating the Northern reaches of the Mississippi River, all of western Tennessee in addition to losing control of both the Tennessee and the Cumberland Rivers. In effect, Johnston had to establish a new northern border for the Confederacy. By doing so, he also established a new line of defense that stretched from Chattanooga, TE in the East to Corinth, Mississippi in the West. A massive amount of land and resources were thus lost to the Confederacy with the fall of Fort Donelson. Then Johnston moved his forces to the rail center at Corinth, Mississippi. He and his second in command General Beauregard, gathered men and equipment there from as far away as New Orleans. This was in preparation for an assault on Grant’s army forming twenty some miles away at Pittsburgh Landing, TE. General Johnston was determined to regain the initiative and the lost territory. All was not well on the Union side either. Not all of Grant’s superior’s were pleased with all the accolades he was receiving after the victory at Fort Donelson. President Lincoln, on the other hand, was happy that he had at last found a general who was willing and able to fight. But Grant’s immediate superior, General Halleck was irritated with Grant’s notoriety and found fault with Grant’s paperwork. He wrote to his superior in Washington City, General McClellan and accused Grant of ‘neglect and inefficiency’. He also accused Grant of returning to his old habit of heavy drinking. Grant further irritated his superiors by suggesting that he be allowed to send troops to occupy Nashville, TE recently abandoned by the Confederates. His request was denied by General Hallect. Instead, he was ordered to return the 5,000 troops he had been ‘loaned’ from General Buell’s force for the attack on Fort Donelson. When he received that order, he was on his command ship, the Tigress. Grand considered his options with his staff. He dismissed the notion of disobeying his superior’s order and moving on Nashville himself. He also had to obey the direct order to return the ‘borrowed’ 5,000 men to General Buell. Grant decided to return the ‘borrowed’ forces to General Buell by sending that force to Nashville to await Buell’s arrival. Thus, Grant obeyed his superior’s order and captured Nashville for the Union without firing a shot. The Northern press loved it, and so did Lincoln. Halleck complained to his superior again and was reminded that he could always relieve Grant of command or court martial him. Halleck chose to remove Grant from command. Lincoln got wind of it and ordered Halleck to either bring charges against Grant or restore him to command. It seems that Lincoln knew of the jealousy behind the affair and did not want to lose the only successful fighting general he had in either the East or the West. So, on March 13, 1862 General Grant was returned to his command. He now found himself at Pittsburg Landing, Tennessee (Shiloh) in charge of organizing the largest army the war had yet seen. The stage was being set for the bloodiest battle of the Civil War up to that time.